This weekend was an incredible shopping weekend for me. I hit the jackpot at the Galleria with several bright pieces and two pairs of shoes! In this edition of In My Closet Now, I feature my brightest new assets. 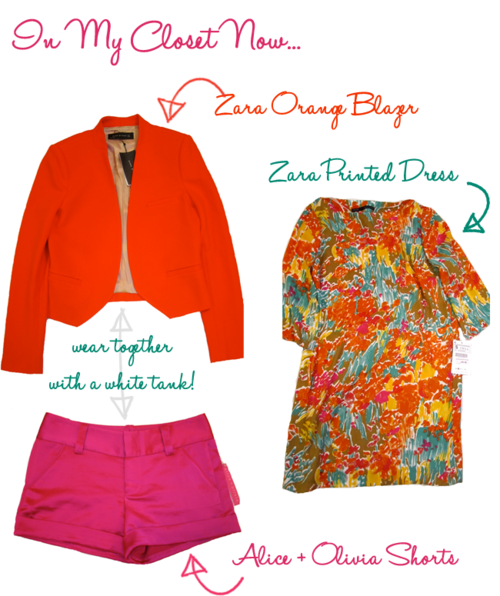 When trying them on at home again, I enjoyed pairing the bright orange blazer with a white tank, turquoise necklace and the pink satin shorts for an overall vivid and feminine look. That’s the kind of color blocking I can wear!